We are delighted to share our 5 Day Kundalini Yoga & Plant Based Retreat hosted by Scotty Leigh-Janney from ‘Introduction to Kundalini Yoga & Beyond’ and his wife Rachel Leigh-Janney from ‘Herbalicious Foods’. Scotty Leigh-Janney (KYTA registered teacher) will be sharing his love of Kundalini Yoga throughout the 5 Days to inspire the mind, body and spirit along with Gong Sound Healing, Meditation, Relaxation and Guided Walks. Kundalini Yoga is the yoga of awareness and our ability to be aware of ourself and where we are truly at each moment. The aim is to influence the kundalini energy to uncoil from the base of the root chakra up through the other chakras towards the crown chakra and experience all the world within and around us and to elevate our consciousness. Throughout the 5 days you will experience how amazing clean plant based food can taste. After running retreats for a few years, we always get asked for all the recipes after the retreat so people can take this into their life at home. We’ve listened to your feedback so we will be running workshops throughout the 5 days where you will be learning how to make clean plant meals (and yes you can have all the recipes after the retreat). All our food is naturally gluten free, refined sugar free and vegan. Please ensure you let us know about any other specific dietary requirements. Arrival on Wednesday 26th June is from 2pm with a welcome meeting and short arrival meditation at 5pm before dinner at 6pm followed by an evening activity. Yoga class before breakfast (known as Sadhana) to awaken the mind, body and spirit. During the morning there will be the option for either a Yogic Workshop with Scotty or a Plant Based Workshop with Rachel. Yogic Workshops with Scotty will consist of Guided Walk, Guided Meditation and Chakra Balancing. Food Workshops with Rachel will consist of making plant based meals including yummy desserts (usually gooey chocolate or cheesecake), everyday basics such as Almond or Coconut Milk along with preparing part of the evening meal. There will be refreshments available throughout the whole retreat so help yourself to herbal Yogi Teas, Fruit and Snacks. A buffet style lunch served will be served each day. An example lunch is Roasted Red Pepper, Tomato & Basil Soup, followed by homemade falafel, hummus, avocado, salad and beetroot quinoa. The afternoon will be free time! If you are the sporty type then there is some great running and cycling paths around the area. Or if you’d love to spend the afternoon relaxing there are lots of gentle walks around the garden or take a gentle stroll down to Coniston Lake. Or feel free to sit in one of the two lounges in the house. One lounge will be a social lounge and the second lounge will be a silent area for anyone who would love some time with their inner self. We will serve a 2 or 3 course plant based evening meal. We adept our menus with the seasons and depending on new things we are creating in the kitchen. Rest assured there is always lots of to eat! After dinner there will be a variety of activities including Gong Bath, Fire Pit, Guided Writing, Talks about how to implement a Yogic and/or Plant Based Lifestyle. We request that lights are out by 10pm. It’s important to allow your body to rest whilst on a retreat and allow it to regenerate your body, mind & soul. Sunday will follow the same format and will close at 3pm after lunch and a short session. We will also provide you with a packed meal for the journey home. After 5 days of clean food the last thing we want you to do is stop off at a service station or not be able to find something healthy! Lanehead is a historic period property located on the Eastern shores of Coniston Water. The venue’s elevated position provides sensational views of the lake and high fells beyond with the village of Coniston within walking distance. We fell in love with this venue as soon as we visited it! There are 8 spacious bedrooms all in the main house and all with ensuite bathrooms. Driving from Birmingham is 3 hours, we like to take a break and have something to eat along the way so we allow 4 hours for the journey. Please ensure you let us know where you are travelling from and we will connect you with others travelling from your area (if you want to car share or travel together). All your yoga classes, mediations and workshops. Please note the Early Bird Price is available until 3 months prior to the event. To qualify for the Early Bird Price the full amount must be paid by Wednesday 26th March 2019. 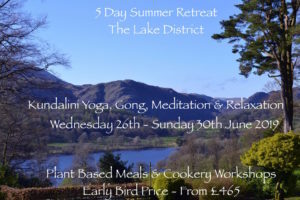 To book and confirm your place at our 5 Day Kundalini Yoga, Gong & Plant Based Retreat a deposit of £75 per person is required along with the completion of our booking form.